I decided I’m going to expand the range of topics in the blog beyond offroading. I really enjoy wheeling, the whole offroading culture and people I meet on jeep runs who share the same passion. 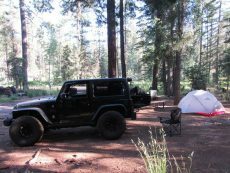 Sometimes however I feel like driving my Jeep some place away from the crowd, far from the city where there’s no cell signal, get out of my vehicle, and enjoy nature more directly. I’m talking camping, fishing, kayaking, hiking or backpacking. We are really fortunate to have so many beautiful places in Arizona, with forests, lakes and rivers that are worth visiting and truly enjoying. Enjoying responsibly. Most places are easily accessible by car, but having an offroad-capable vehicle gives us a chance to discover some hidden gems. We’re lucky because our vehicles can take us to places where others can’t go. We can venture deep into the back country, follow the trail for as long as we want and then set up camp. We can just relax and enjoy the spot, go on a backpacking trip or a day hike. I’ve always enjoyed camping, backpacking and hiking. The outdoors in general. I recently decided to update my gear, trying to find a balance between good quality ultralight equipment and the price. I have been acquiring new gear over a period of several months and intend to keep doing it into the future. All this gear needs to be tested in the wild, so any chance I get, I head for the back country or at least the desert away from the city. I am going to post short articles describing the locations I visit and my experience with the gear I selected. I am going to share my thoughts and opinions on all kinds of camping, backpacking and hiking gear I decided to purchase for myself. Some of the categories of gear will include: shelter, sleep systems, backpacks, cooking systems, water storage, water filtration and more. I will be sharing descriptions of the campgrounds I had a chance to visit. I will include directions to the site, description of the campsite and amenities, and include some photos of the site. I will be describing trails I hiked, including directions to the trail head, description of the trail and photos. You really do not have to go far from the Valley of the Sun to find a great hiking trail.